Since we haven't touched on this custom wallpaper imagery inspiration in a while, we're happy to bring back architectural elements. This is the fourth installment in this series, and we don't see an end in sight. 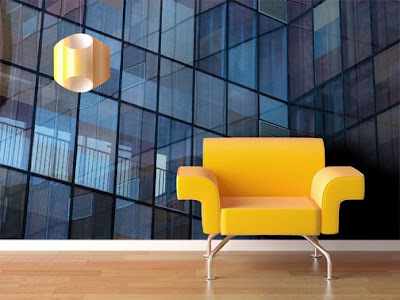 The presence that a wall mural featuring architectural elements has can't be ignored. The inspiration room gets a brand new dimension of depth with the image of the crook of a building. The window grids ground the look with a bit of rigidity, while the subtle variations of blues and purples of each pane lends a playfulness to the mural. With each pane being colored slightly differently from the next, a sort of glass patchwork quilt effect is created. If subtle color variations aren't your bag, consider creating the wall mural in black and white, a great treatment for any architectural wall mural. With an image like this, there's a voyeuristic element to the wallpaper, as if you're looking in at another world. Take a a fresh look at your decor scheme, there just might be room for your own custom wall mural.